Once upon a time, back in the muddled middle of the 20th century, Arthur Holly Compton, the Noble prizewinning physicist and chancellor of Washington University at St. Louis, was perturbed. Automobiles, it seems, were racing around a section of campus known as Hoyt Drive. Their excessive speeds were sufficiently troubling to inspire Compton to sketch out, on graph paper, something he called “traffic control bumps” to slow down the out-of-control Show Me State motorists. The bumps, which were later known as Compton Bumps or Holly Humps, were implemented in the spring of 1953. The bumps were, it is said, quite popular—surely because they made the Hoyt Drive experience slower and less dangerous. The road to improving our digital lives isn’t an absolute rejection—abandoning the vehicles or shutting down the information highway—but rather hitting the breaks, just a little, to avoid wrecks. 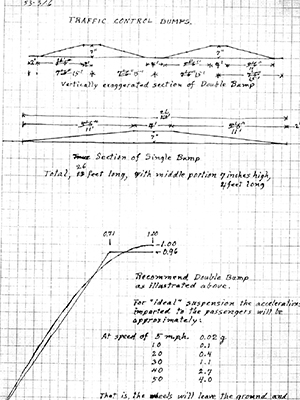 Roose might have said “slightly slower” rather than “slightly less simple” because he was essentially talking about technological speed bumps, a slight but intentional deceleration, in the name of safety. The road to improving our digital lives isn’t an absolute rejection—abandoning our vehicles or shutting down the information highway—but rather hitting the breaks, just a little, to avoid wrecks. We’ve seen plenty of wrecks: data breeches, bot mischief, massive organized misinformation. Consumers know them, hate them, worry about them but feel like they are becoming increasingly difficult to bypass. As I thought about Compton Bumps, I recalled, of all things, the Amish and their unusual approach to technology. Yes, the Amish—the people of the fabled buggies, the long beards, the barns—if anyone, they would approve of the idea of Holly Humps! According to this NPR report, they focus less on automation than consideration: “The Amish don't automatically embrace what's new, they evaluate it and decide if it's a good fit for the lives they want to lead.” The Amish aren’t early adopters but careful ones. There might be some opportunities in their ethos. Imagine your customers asking: “Is this a good fit for the life I want to lead?” at their next visit to Best Buy or before they download your next app! Doing so might help designers understand the feelings behind question and respond appropriately. Could this mean creating a tiny, reassuring pause, built into their tech, to appeal to such question-asking people? Possibly. Might be worth testing out. This would be a decidedly unusual and new stance for producers of tech to consider. To illustrate the prevailing attitude, Roose cites Box CEO Aaron Lavie: “If you’re making the customer do any extra amount of work, no matter what industry you call home, you’re now a target for disruption,” which is a pretty good indication of the how organizational fear pairs so well with consumer laziness. Until very recently, the notion of speed at all costs was understood, either consciously or unconsciously, as correct. There might be a market for somewhat slower, safer, more careful digital experiences. Imagine making digital speed bumps a differentiator between you and your competition. But Roose’s essay suggests to companies there might be a market for somewhat slower, safer, more careful digital experiences. Imagine, if you will, making digital speed bumps a differentiator between you and your competition. The new disruptor could well be the organization that emphasizes, say, safety in design, privacy protection, effective banning of trolls and bots, and competent management of misinformation. Imagine, say, a social network that solves the problems of the current social networks, but it requires something extra from a user to make it “go.” Doesn’t take much imagination to see how this a newer, slower, safer business model might just make a lot of sense. Think, for instance, about two-factor authentication. That’s a pretty good illustration of how a digital speedbump might work; but there are surely more ways in which we might slow things down to make them better. Taking a close look at our digital experiences, with an eye for where speed bumps might be placed, is something for both designers and business strategists to consider. The previously undoubted supremacy of the frictionless experience is starting to meet up with some dubious customers. This is an opportunity for companies and designers—and ordinary people—to create something new. The question is: who will be able to resist the conventional thinking that always votes for faster? Which executives, designers, and consumers will understand that a change of pace might well win the race? Don’t know about you, but when I drive slowly over an asphalt-based speed bump, I feel like it’s worth the added seconds. The value-to-pain ratio is exactly right. Might be wise to hold onto to this feeling when charting out our customers' digital journey maps. How might you design digital products and services so that you customers won't feel like they’re being steered in a direction that’s completely out of their own control? In the digital transformation grand prix, the cup might ultimately belong to those who understand that the race isn’t solely about acceleration.